I decided to use the latest Groovi Club plate to make a new home card but with a bit of a difference in that the parchment panel was popped behind a 'brick' layer which of course solves the problem of how to attach parchment to a card. Glue is a bit of a no-no for parchment and I don't always want to use brads. The design was traced to fit a certain size circle with some hills added using another plate, then coloured using pencils. 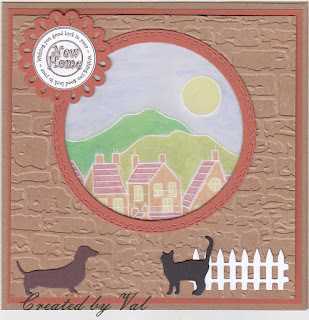 The brick wall effect was done using an embossing folder after I'd cut out the circle from the piece of kraft card. I also cut a frame using the same die set. Once assembled I thought it needed a little something extra so as well as a sentiment I also added a little picket fence, a lucky black cat and a dog. They do seem to be facing each other out but hopefully they are friends!! What a cool new home card - it's really different and I like it very much! as I aid to Wendy on her blog I do admire people that can do parchment craft. It always turns out so pretty and very delicate. Love theis design, and your super work. A fantastic new home card Val. I love the brick effect embossing folder that you've used for it too.